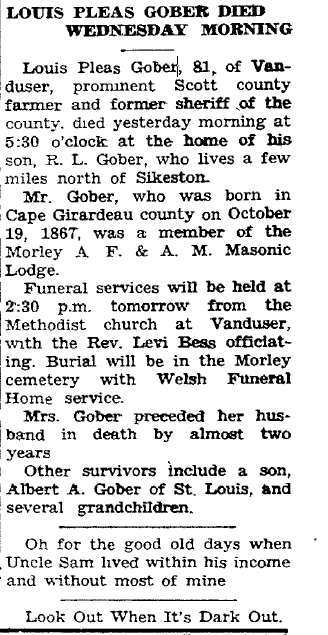 This week I am sharing the obituary for my wife's 2nd great grandfather, Louis Pleas Gober. It appeared in the November 4, 1948 Sikeston Herald, and I retrieved the image from Ancestry.com. Louis Pleas Gober, 81, of Vanduser, prominent Scott county farmer and former sheriff of the county, died yesterday morning at 5:30 o'clock at the home of his son, R.L. Gober, who lives a few miles north of Sikeston. 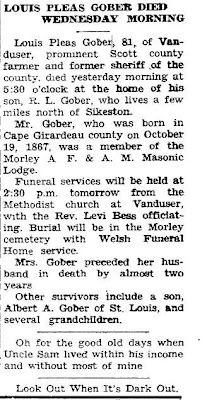 Mr. Gober, who was born in Cape Girardeau county on October 19, 1867, was a member of the Morley A.F.&.A.M. Masonic Lodge. Funeral services will be held at 2:30 p.m. tomorrow from the Methodist church at Vanduser, with the Rev. Levi Bass officiating. Burial will be in the Morley cemetery with Welsh Funeral Home service. Mrs. Gober preceded her husband in death by almost two years. Other survivors include a son, Albert A. Gober of St. Louis, and several grandchildren. 1) I've transcribed previously a couple news stories from LP Gober's career as a sheriff. He naturally appeared often in the area newspapers, and there are several that have been digitized.